When you’re only away for a few days, the food you eat can have quite a big impact on how you feel the holiday went. 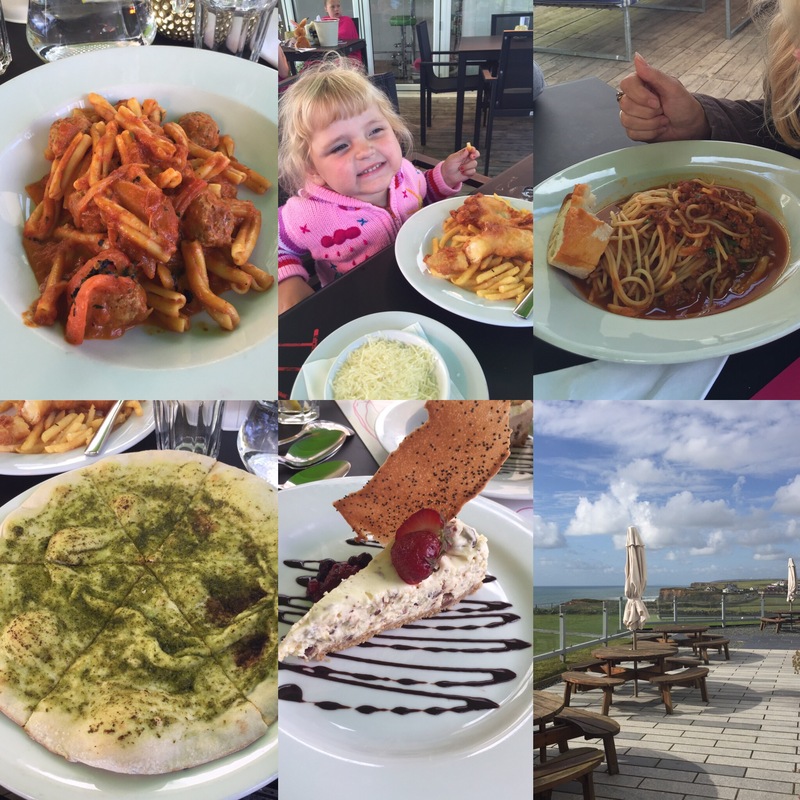 Luckily, although the trip started off badly, we found better places to eat on our second and third day and came away from Devon/Cornwall with mainly happy memories and happy tummies. In case you are planning a trip to the same place anytime soon, I thought it might be a good idea to let you know where’s good and where’s awful in the Cornwall/Devon border. When we arrived at our guesthouse, we asked for recommendations of where to go for dinner, as we were a bit out in the middle of nowhere. Our host suggested The Village Inn and even booked a table on our behalf. The experience from the moment we entered the pub was bad and just kept getting worse. From being directed to our table (behind the creepers) rather than being taken there, to not having our order taken without reminding the bar staff, to waiting over an hour for our main course (they had a party of 14 in apparently and they couldn’t cope, though this wasn’t ever mentioned to us prior to ordering or during our long wait). When the food finally did arrive (after I had to ask at the bar again), I couldn’t enjoy it as I knew I was going to have acid reflux from eating so late, and the kids were too tired to finish theirs as well. At the bar for the third time (because who knew when we would have got the bill if we had of waited at the table), I questioned the barmaid if she would have been happy to pay full price for the service we had been given. She smugly said yes and when I dared to say we weren’t happy and wouldn’t be paying the full amount I was subjected to such rudeness from her, the locals at the bar and the landlord who was sat on his bum drinking (as he had been most of the night when they were apparently run off their feet), that we gave up trying in the end and left to a further barrage of abuse. I have never experienced this low a level of customer service and rudeness from staff and management before in my life. An awful start to the trip! 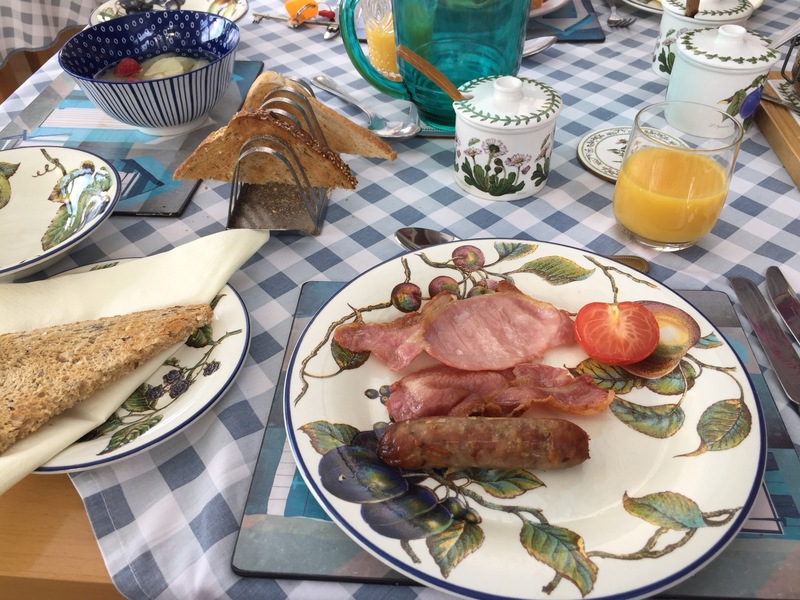 On our second day we were, understandably, a little worried about finding somewhere that would give us the same level of poor service and we hoped to find somewhere better. We had been out to The Milky Way children’s amusement park that day and decided to drive into Bude to find somewhere to eat. As luck would have it, we couldn’t find anywhere in the little town centre so drove out the other side, towards Widemouth Bay, where we came across Elements. It was only 5.30pm but the restaurant itself was fully booked. Not a problem as they also have outdoor seating. I was a little concerned we would be cold as it had been very windy that day and there was a bit of a chill about. Fear not as the incredibly friendly waitress brought us out some blankets and turned the outdoor heating on for us without us needing to ask. Service was quick and friendly throughout the meal and we were made to feel welcome and important with little touches such as separate plates for the children when they shared a dessert and a box to takeaway our leftover food in. After the awful service the night before, anything would have been an improvement, but this place went above and beyond to make their customers feel welcome and special. The food, although not the best I’ve ever tasted, was definitely worth a visit. The view from the restaurant is amazing too. 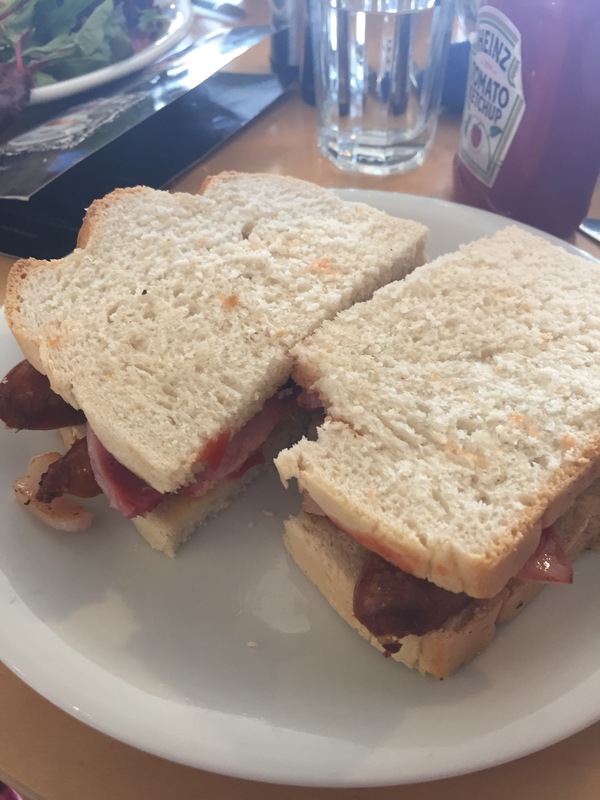 On our third and final night, we were tempted to head back to Elements, but their menu hadn’t been that extensive and we fancied a change so we headed back into Bude and I had a little look on Tripadvisor for some suggestions. 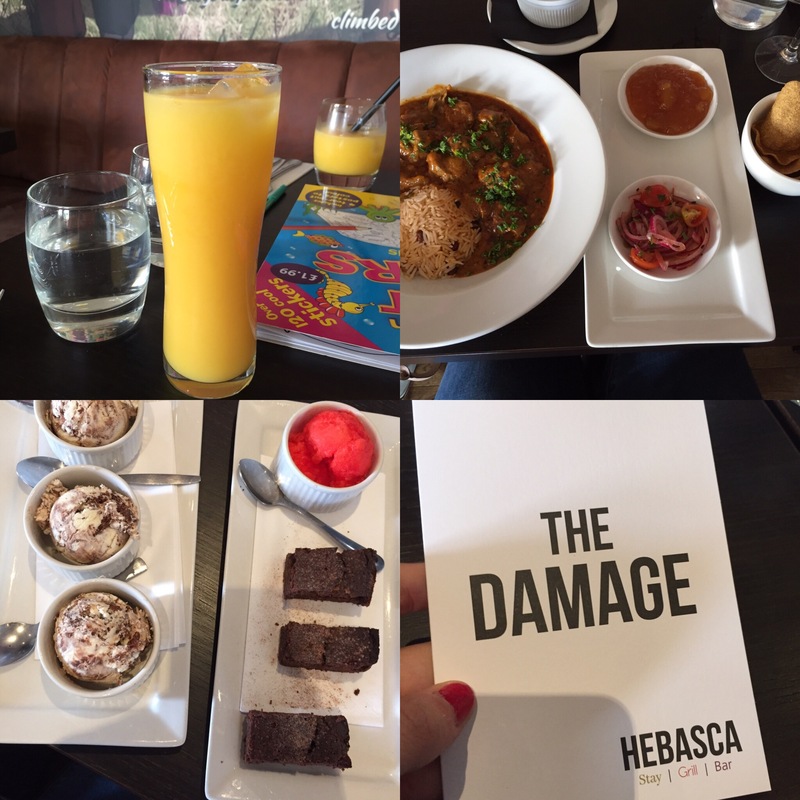 We parked up by a place called Habasca, and when I looked it up it had brilliant reviews and on their website, a menu which looked yummy but affordable- the perfect balance. We had arrived at 5pm and they didn’t start serving until 6, but as the kids had fallen asleep in the car anyway we decided to wait. The restaurant was empty when we went in bar one other table with a group of men. 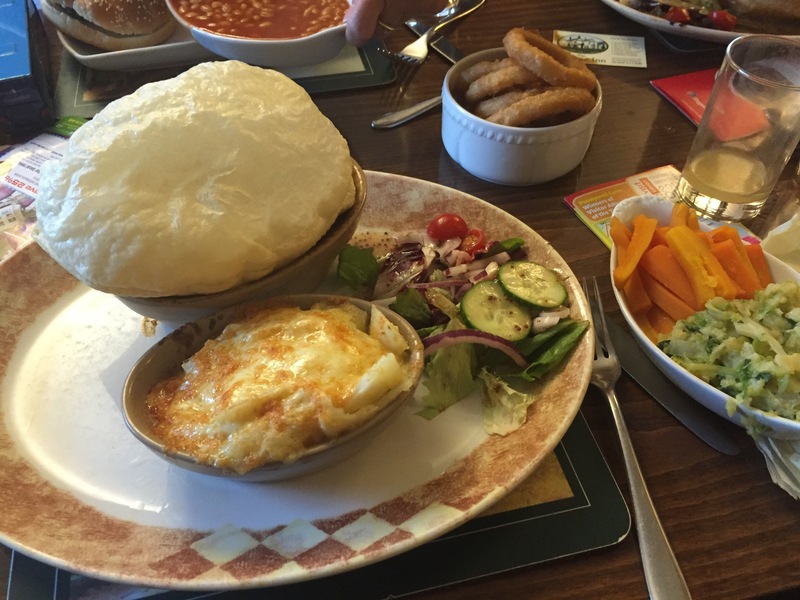 The service was warm and welcoming and we were served drinks and our food quickly. The food was delicious. I had ordered a lamb tikka masala which came with poppadoms, mango chutney and a spicy mix of tomatoes and red onions. It was most probably the best curry I’ve ever had and the lamb was cooked to perfection. I had a sneaky taste of the kids’ fish and chips and also thought this was incredibly yummy. My mum enjoyed her chicken burger and chips as well. Unfortunately, service wise, it went down hill a little as soon as the place started filling up and the staff became busier with other tables. We waited a long time for the dessert board to be taken away from our table and for desserts to come. The dessert concept itself was really cool though. Instead of full sized options, they provide mini taster desserts priced at £1 each and you can mix and match and order as many as you want. As the food was filling, I would suggest only ordering 2 or 3 as we ordered 2 each and went away stuffed. I had the chocolate brownie and the blood orange sorbet. The brownie was incredible and I would have quite happily eaten two if I hadn’t of already filled up with my curry. It was a shame that service slowed so much towards the end, but food wise I would 100% suggest a visit if you’re visiting Bude or the local area as you will not be disappointed. The menu is heavily meat based and the decor is ranch style, so perhaps not one for the vegetarians (though they did have a couple of tasty sounding meat free options). The place and the food itself has a feel of high end sophistication but the prices are reasonable (my absolutely delicious curry was under £9 and the children’s menu was priced at £3.95). Worth a mention as well is The Morwenna Cafe in Bude, which is where we had lunch when we arrived. Service was incredibly slow (it took around half an hour for sandwiches to be served), but the food itself was pretty tasty and the location is good (in central Bude, just before you read the beach). Finally, our guesthouse The Hollies, set us up each day with a Full English breakfast, which although wasn’t the best I’ve tasted, was perfectly adequate and cooked well. Do you have any other recommendations should we return to the local area in the future?